I was musing about the differences between these three concepts. They are not explained clearly in any resource I could find (although many people take a stab at this), so I thought I’d try bending my brain around the problem. The three types of collectivity appear goal-oriented (as in, sharing a common purpose), but there are big differences between the ways in which group members interact – and the reasons for these types of interaction. Cooperation is when people share ideas about how to work, or share effort to complete the work towards a shared goal, which is understood in common. People work together to complete a task that would be much more difficult to complete individually. Cooperation often involves deciding how to divide the work between individuals in a group for an optimal outcome – for example, in software or organizational change projects. Work may be divided laterally (each person takes a separate slice of the work towards a deliverable), vertically (each person takes a separate deliverable), or performed collectively, where people share the effort required to achieve a goal (for example, analyzing a business process that is too diverse – involving too many stakeholders – for one person to explore in a reasonable amount of time). Coordination is the organization of work-tasks across individuals to achieve a complex goal that requires analysis (breakdown into subtasks) before it can be addressed. People work together towards a common goal within an agreed timeframe, even if they don’t understand all the tasks required at the start. They organize their activities around a schema, which provides a model of the parts of the work to be done. They divide their labor on the basis of this schema, with individuals or sub-groups completing each part, which is assembled into a whole once all relevant parts have been completed. They may collaborate to perform shared subtasks. 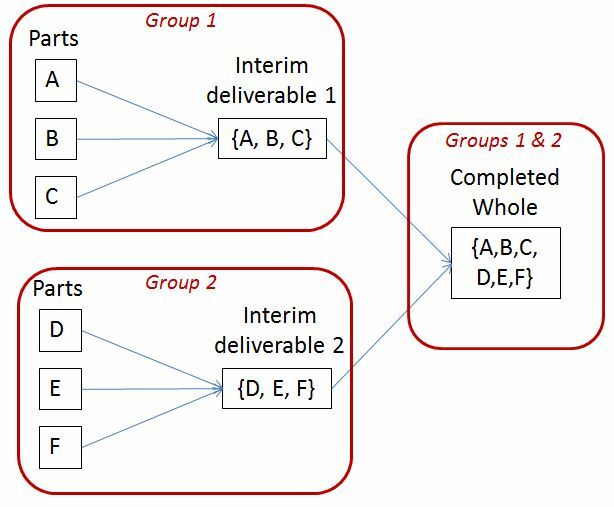 Coordination may be organized around interim deliverables, which are completed individually from subsets of the work-schema, then assembled once all the parts are complete. The underpinning concept to coordinated work activity is that of a plan – a plan of work, or a plan of how the parts of the whole are organized. This is used to guide the coordination of work, across individuals and across groups. For example, in traditional software project management, work is coordinated around a work breakdown structure (WBS). Collaboration is the pooling of effort, to achieve a joint goal, which everyone in the group of coordinated workers may not understand in the same way (so this is not a shared goal – subgoals may emerge through the processes of discussion and experimentation over how to perform the work). People work together, taking different parts of a task, to achieve a goal that, if not understood in common at the start of the process, will probably be understood in the same way by the end. Collaboration requires trust (that other people will work towards a common goal), but it is more adaptive than coordinated work – instead of agreeing a model of the task in advance, collaborators develop a shared model of the task deliverables as they collaborate on the task. Working together increases the amount of shared understanding between people, which allows them to improvise and adapt the plan of work to contingencies that arise. So both goals and work-practices evolve as shared practice increases shared understanding between collaborators. Software developers, working on agile software projects, collaborate in analyzing how to coordinate their team’s work around a feature-breakdown then coordinate team work around each person implementing the next feature in the backlog. Finally, they collaborate around integrating the feature components into a coherent prototype system.